SMIDGE OF THIS: 5 on Friday Link-Up! I'm thrilled that it's Friday, and therefore time for another 5 on Friday Link-Up! I do hope you'll join Darci, Natasha, Christina and me on this FIRST DAY OF SUMMER! Here's what I'm loving this Friday. Wait -- you mean it wasn't summer already? But what about that string of days in the mid-to-upper 90s where we were just dying of heat? Oh. That was apparently spring! Now that it's summer, I'm even more excited about weekend plans -- weddings, engagement parties, lake weekends, and hopefully just a few free weekends to lay on the couch at home with the AC blasting. 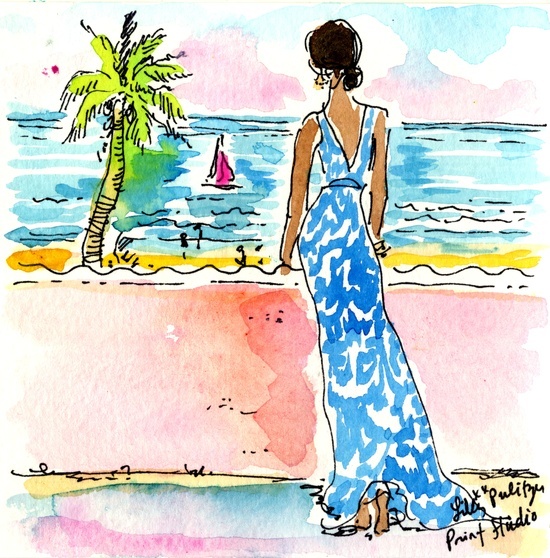 Speaking of the first day of summer, did you know it's National Wear Your Lilly Day? I've got one of my favorite shirts ready! Yesterday was quite a treat -- after wrapping up a meeting with a client down in Columbia SC (my hometown), I was able to meet Mom out for lunch before heading back to the office! We met at Lizards Thicket, which any South Carolina girl will know about and vouch wholeheartedly for! This locally-owned "meat and three" chain is one of the things I miss most about living in Columbia. Mom and I had an awesome time having lunch together. Such great chats. And it goes without saying that my mac & cheese, fried okra, and green beans (oh! and cornbread) were absolutely incredible. A splurge that was worth it. Patio beautification time! We are having our patio painted today and I couldn't be more excited. We are changing it from a beige/stone color to a medium gray. I can't really imagine yet what it will look like, but I'm excited for a change! Tomatoes ... I'm growing them! Actually growing them! 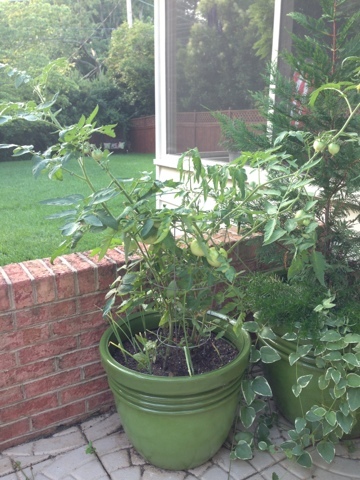 I promised Ian that this would be the "year of the tomato" and so far my plants are doing awesome. I've got them growing and green, now just time for them to turn red and ripe! I also have some onions planted at the base of the tomato plants that you can see below. 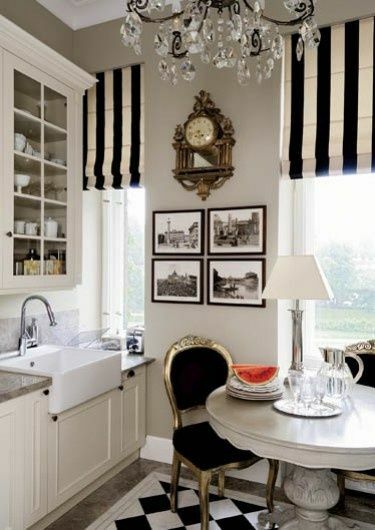 This kitchen.... ooh la la! I truly think this one picture probably sums up my perfect room. We are not looking to move any time soon, but if and when we do, I think this will be my number one inspiration pic. Your turn -- link up your 5 on Friday here! And you and Christina are the queens of two things (well, many more really) :::: cocktails and growing fun plants!! Lemon tree and tomato goodness going on right there! I can't get over that kitchen - gorgeous! And that's exciting about a new look for the back patio! Change is always fun! Happy almost weekend, sweet friend!! 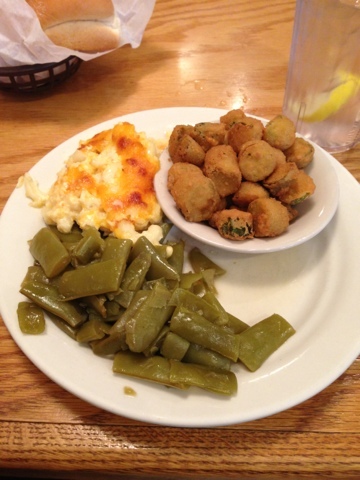 Side note: it's totally abnormal to be craving fried okra at 6:30 a.m., but it's happening over here....that looks SO good! And omg home grown tomatoes .. yum! Can't wait to see the patio and that lunch looks amazing! Happy Friday! I am so jealous that you got to have lunch with your mom. I wish that we lived closer so I could see my family more. 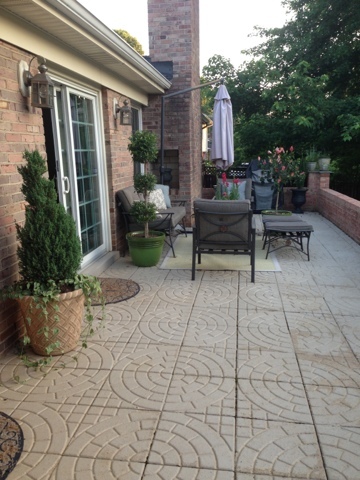 Cant' wait to see pics of your patio! We are also growing tomatoes....well 1 tomato LOL and some jalapenos! Have a great weekend! that comfort food has my name written all over it...YUMMY!!!! ohhh and the patio--keep us posted and i want all sorts of pictures shared when you get done working your magic friend!! when I lived in SC(rock hill) for a year, I was introduced to the meat and 3 lunch places-LOVE! oohhh i love your patio! teach me your ways - mine needs maaajor help! Happy Friday girl! Woop woop!!! Your patio is perfection! Can't wait to see the new color! 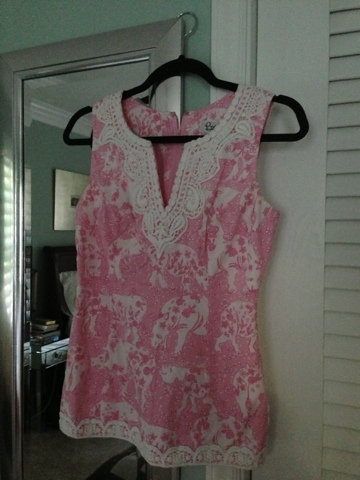 I have that exact same top in a different pink pattern. Might even throw it on for work this afternoon! I love the meat and three, and on occasion, I just get four vegetables. I haven't been able to find a really good one here in Raleigh. Wanted to say hi. I finally found some time to join your link up this week. I think it's great, and I plan to do it again. I grew tomatoes for the first time this year and I have tons growing right now. I can't bring myself to pull them and off and eat them though. But I look out each day and smile because I usually kill all my plants! I am not from the South, but that lunch looks delish! 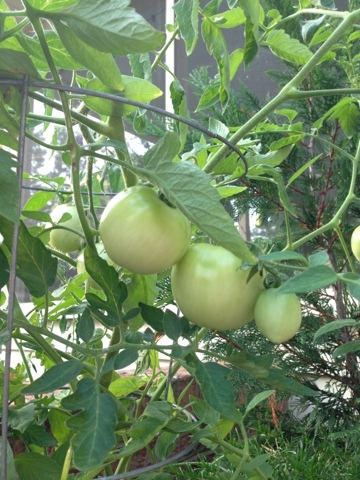 I usually grow tomatoes in the ground, but trying one in a pot this year and so far I have some large green maters on it! Hopefully we'll both be successful with them! Love Lizards Thicket! Mmm I could go for some of their chicken and dumplings right about now. your patio looks amazing! I bet you have TONS of wonderful evenings sitting out there relaxing! OMG LIZARDS TICKET!!! I spent SO many evenings thre after JTL matches!!!! Your patio is gorgeous! Can't wait to see how the new color turns out. Happy first day of summer! Blast from the past- Lizard's Thicket! Those restaurants are all over Columbia. We lived there about 10 years ago for a few months. Patio will be awesome. Can't believe I missed National Lilly Day!